While the Distributed Proofreaders website is down, you might like to check out some of the other books we’ve already posted to Project Gutenberg. 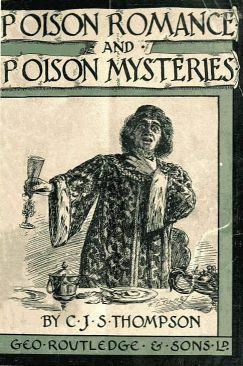 One you may enjoy is a book I read recently, Poison Romance and Poison Mysteries by CJS Thompson. This thoroughly enjoyable book, published in 1904, begins with an advertisement for the health-giving properties of Eno’s Fruit Salt and ends with an advert from a tea and coffee purveyor. I’m not sure they’d have been too happy at the association with poisons. It’s partly a history of poisons and poisoning and partly a titillating true-crime book, with a foray into criticism of the use of poison in fiction. Interestingly, tobacco is included in the list of poisons, it seems that even in 1904, tobacco was considered harmful by some. Be this as it may, the moderate smoking of tobacco has, in most cases, even beneficial results, and there appears little doubt that it acts as a solace and comfort to the poor as well as the rich. It soothes the restless, calms mental and corporeal inquietude, and produces a condition of repose without a corresponding reaction or after-effect. In adults, especially those liable to mental worry, and all brain workers, its action is often a boon, the only danger being in overstepping the boundary of moderation to excess. the lady novelist is the greatest sinner in this respect, and stranger poisons are evolved from her fertile brain than were ever known to man. Real life poisoning cases are described and analysed, including various ladies who were accused of murdering their husbands and lovers, a doctor who murdered his brother in law, another who killed his wife and mother in law, the infamous Neill Cream who killed a number of young women, and a celebrated recent American murder case. In recommending this book, I really can’t put it better than the reviewers did at the time. My own review? A fascinating, entertaining book that should be on everybody’s ‘must read’ list.